Apparently I was supposed to help her with her English, but we skipped over that part quickly and instead became fast friends, and usually could be found eating good food all over Franklin Street and laughing all the time. I’ll never forget when I went with her to my first ever Thai restaurant, and I ordered Thai Pineapple Fried Rice, Khao Pad Supparod. I scooped a bite out of the little pineapple bowl, and once the flavor hit my mouth, it was like meeting someone for the first time, but connecting like I’ve always known them. I had never eaten a meal that had such an array of flavors packed in it all at once: thai soy sauce, lime, cashews, green onion, pineapple, turmeric, and garlic. From that moment I fell in love with Thai food, and took first step on my journey to Thailand. I’ve only fallen even more in love since. 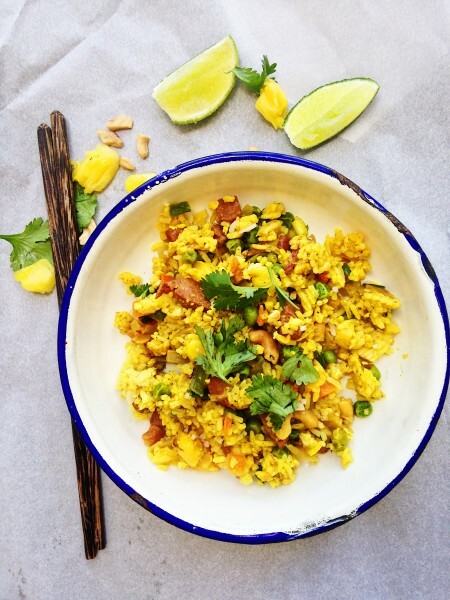 I had never tried making Thai Pineapple Fried Rice until recently, and I’m not sure why. Maybe just so it wouldn’t lose the magic or something? But I finally gave it a shot after going to a Thai restaurant and seeing how expensive it was on the menu and knowing I could make it at home, and it would be cheaper and hopefully even taste better! I made it and was so so glad I did. It reminded me of why I first fell in love with Thai food, and what a gift it is that now I can just make it at home whenever I want. Whether you’ve just started trying to cook Thai food, or have always loved it, this recipe is for you! 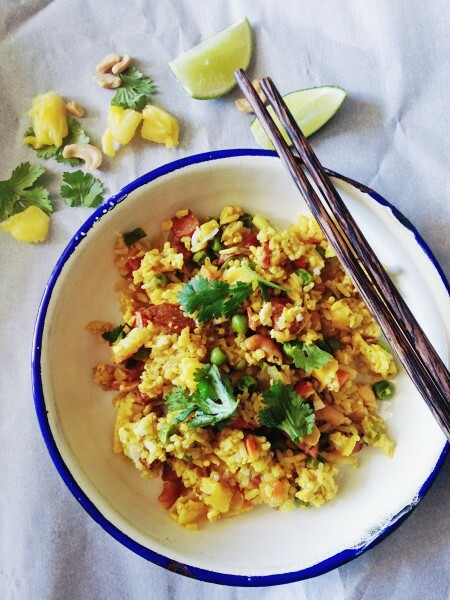 Make Thai Pineapple Fried Rice today, and fall in love all over again with Thai food!! 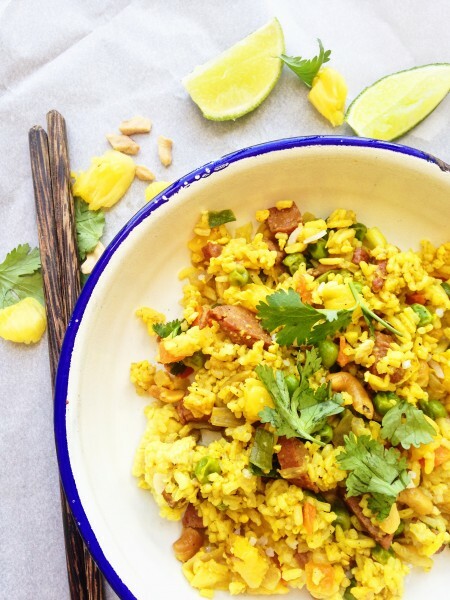 Thai Pineapple Fried Rice is full of the perfect combination of Thai flavors, and an easy weeknight meal! Warm a few teaspoons of cooking oil of your choice in a wok over medium high heat. Add the eggs and scramble until set. Add the garlic and onions, and stir-fry until fragrant. Add the diced meat, and stir-fry until cooked through. 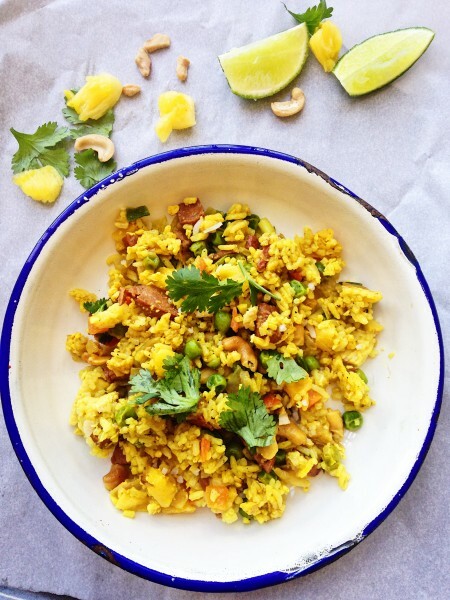 Or leave out the meat, and make Vegetarian Thai Pineapple Fried Rice! Add peas and carrots (or whatever veggies you have in your fridge you want to use up), cashews and pineapple. Stir-fry until warmed through. Once everything is fully cooked, scoop all that is in the wok into a separate container. Add a teaspoon or two of cooking oil to your wok on medium high heat. Make sure you've broken up the rice, so it's not in any big chunks. Add the rice to the wok, and stir-fry until warm and glistening. Add the turmeric. Stir-fry until the rice has become a sunny yellow, and turn off the heat. Add back the ingredients you took out, and also add in the green onions, and sauces. I usually don't measure my sauces, and instead add a little at a time, and taste it until it reaches the flavor I like. WARNING! Be careful not to add too much Thai soy sauce or oyster sauce because then your fried rice will be gooey! Add only a few teaspoons of the sauces, and if it's still not savory enough, add a little salt at a time until it's reached the flavor you like. Sprinkle cilantro on top, and add a wedge of lime on the side of each serving.